Beta testing in itself can be a challenge. There is a large spectrum of aspects to consider. For example, you need to make sure you achieve your objectives, have a strong team, resolve the issues, have the right beta testing tools, obtain beta feedback and recruit skilled beta testers. You should also look for capabilities in your management software tool that allows you to track all users’ activity and provide you information about the testing process through recordings such as screenshots and video sessions. Having the capability for testers to submit bugs and crash reports are also very useful. The idea is to make your process as easy, accurate and efficient as possible. With a great management testing software, this can alleviate and prevent a lot of stress. Great care must be put into your testing. After all, the results from your beta test and what you do with those results will directly relate to how well your product survives in the real world. If managing one beta test is hard enough, how does one manage several beta tests at once? Do you have the right beta test management software? There will always be challenges that arise, results that are not in your favor, impatient people, and deadlines. On top of this, there could be unexpected delays, miscommunications, and unwanted crashes that keep occurring at the last minute. Things will not always go as smoothly as planned and it’s vital to be as prepared as possible — especially when you have multiple beta tests running at once. If you are not careful and organized and using the right tools to help you, it’s quite easy to lose control. 1) Do you have a clear plan? First of all, you don’t want to juggle your projects without any constraints. What is the plan and how will you go about it? Create a breakdown of your test, allow and consider time for interruptions and delays, and clearly, define each stage. With this kind of a road map, you will be able to follow the plan and give yourself some room to make wrong turns. The idea is to expect these misfortunes and still be able to make your way back to your target. If you do not give yourself some room for the errors, panic and frustration will kick in when the deadlines are not being met — and no one wants to experience that. Test your product, receive feedback, allow a realistic timeframe for developers to figure it out, adjust it, fix it, test it again, and have enough time to do it all again once more. Do you plan for exploratory testing only or add test cases for a more organized process? How many stages will your test have? What is happening in each stage? When are the exact deadlines? Take the time to create your schedule and detail the expectations of your test. Further, if you choose to test with test cases you must make sure that your management tool offers test cases support and a way to report the results clearly. 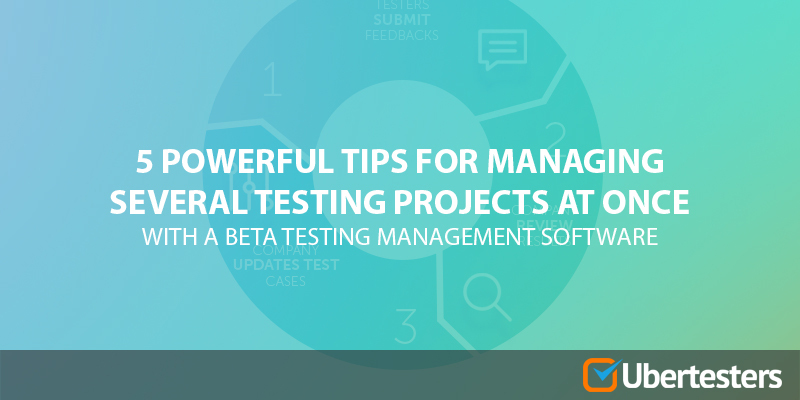 Being able to monitor your project with the right beta testing management tools may make all the difference. A great management tool will allow you to measure and track your progress, see an analysis of your feedback, and give you the ability to interact with your testers. 2) What is everyone’s role and responsibility for your project? It is as important to have a detailed road map for each beta test, as important to allocate the right people and assign the responsibilities. Who is managing stage 1? Who are involved in stages 4 and 5? What is the breakdown of their roles and responsibilities? What exactly happens when there is a delay at stage 2? If no one has his own territory then it would be the perfect breeding ground for miscommunications, assumptions and a great big mess. Too many people may group over in one area while other crucial areas are neglected and skimmed over. Balance is a key. However, in this case, we need more than just balance. We need balance, focus, and strength in each area. We think that the most successful way to run several tests is for everyone to know their exact role, their responsibilities and what they need to accomplish. Multiple experts should be allocated to each role. That way, there is a balanced and powerful spread across all areas of the test. There will be no room for confusion or miscommunication if everyone knows exactly what they need to do. When each stage is carefully monitored by multiple experts, you decrease your likelihood of errors. In addition to this, we believe that it’s important for a project manager to be completely aware and engaged in all aspects, especially those involving quality assurance. The project manager is the key to pulling the project together and making sure that all processes are functioning as expected. With many complicated tasks at hand, we urge the importance of having a reliable management tool to aid with the process and in managing the team as a whole. At Ubertesters, we ensure that your test is being managed with great care. We purposely have clearly defined roles for beta management such as the owner, the administrator, the members, among which are the project manager, the QA, the Developer, and the beta testers. Each person and role plays an important part in managing your project. We understand the importance of spreading out the responsibilities and assigning each person a specific target to monitor, and above all, the great importance for the project manager of the beta phase to really be able to control and manage the entire beta testing process and team’s activity. This is to ensure that we are giving you our best results. 3) Are you effectively managing your workload and time? Are you being realistic with your timeframe? 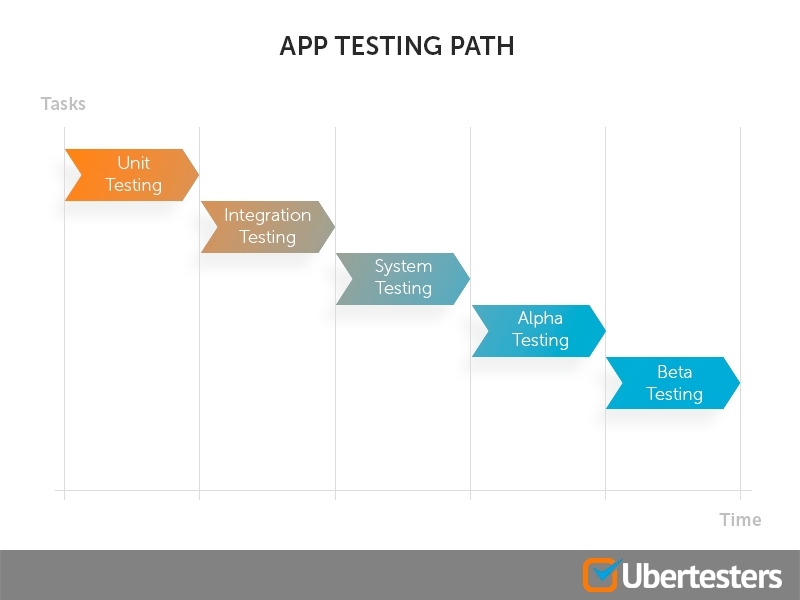 Take into account the amount of time it takes to complete one beta test. If you are trying to manage multiple tests at once, you must make sure that you are giving yourself a reasonable and realistic time frame to accomplish your goals. Some stages will take longer than others. Whenever you plan on sending out surveys and are waiting for information or feedback, expect it to take much longer than it should and plan accordingly with this in mind. People are not always efficient and it does take some time to get the responses you need. Factor this into your timeframe and you will not be disappointed. Provide your team and others with reasonable deadlines and reminders to ensure an efficient flow. Is the workload balanced in all areas of your beta test? Are there some known weak and strong spots? Are you allocating your team as efficiently and as fair as possible? The complexity of each area must be factored into matching the right amount of experts to each field. If this is done with care, your team will be balanced and work as efficiently as possible. There will not be an overwhelming amount of stress in one area, which will increase the likelihood of mistakes and delays. At Ubertesters we have distribution groups set up to help organize your project. You can add and monitor the members in your project through our platform. The range of distribution groups can include internal QAs, hired QAs, testers, developers, beta users, different focus groups etc. As a member, you can also easily track the stages of your beta testing. Our beta testing management tools and software allow you to see all their activity. For example, for managing your test’s activity, you can follow its current and previous testing sessions, recent users’ activity, reported issues, reported crashes, and uploaded builds. On our platform you can also check the feeds for all testing sessions. You will have access to the number of reported issues and crashes, its active testing time, the tester’s name, the device status, the device info, and the entire activity stream. In relation to this, you are definitely able to keep a close eye on all recent activity and the members’ activities. This is accessible to all project members, but the type of information provided and shown depends on the member’s role. This is a way that we can track everyone’s workload and make sure that everything is running smoothly. 4) Can you easily report and track the results and found issues? Another feature that will be extremely beneficial to have in your beta testing management software is the ability to receive clear descriptions about issues through screenshots, video recordings, and text. The more descriptive you can be, the easier and faster it will be to locate and solve issues to give you more time to focus on other matters. Allowing yourself to have different methods of describing issues make it easier to be found and reproduced by the developer. This also goes hand in hand with making sure that your testers have a tool which allows them to easily report issues wherever they may be. Problems don’t always arise in the comfort of your testers’ home, so it’s best to have a great tool which allows them to record and report issues when they are out and about. 5) Do you have the right beta testers? Making sure that you have the right beta testers for your project is also important to factor in. With the right people testing your product, you will easily deflect a handful of unnecessary problems. The management of your beta tests rely heavily on the efficiency of your team and especially your testers. If your testers are experienced and know what is expected from them, you will not be disappointed with slow feedback or testing wrong areas. Just like what was previously mentioned above, the roles and responsibilities of your team should not be overlooked. The beta testers for your project should be informed about what is required and expected from them. A timeline of deadlines should also be enforced. This way, there is no ambiguity or confusion but most importantly there won’t be so many unexpected delays. You will need your team to be as efficient as possible and breaking down the objectives with strict deadlines will help and strengthen your project. Getting the right people matched with their designated jobs will also help make it easier for you to manage several beta tests at once. With this, you should also consider investing in an external crowd testing company. The company should be specialized in crowd testing services to give your project the care it needs to be conducted properly, efficiently, and cost-effectively. 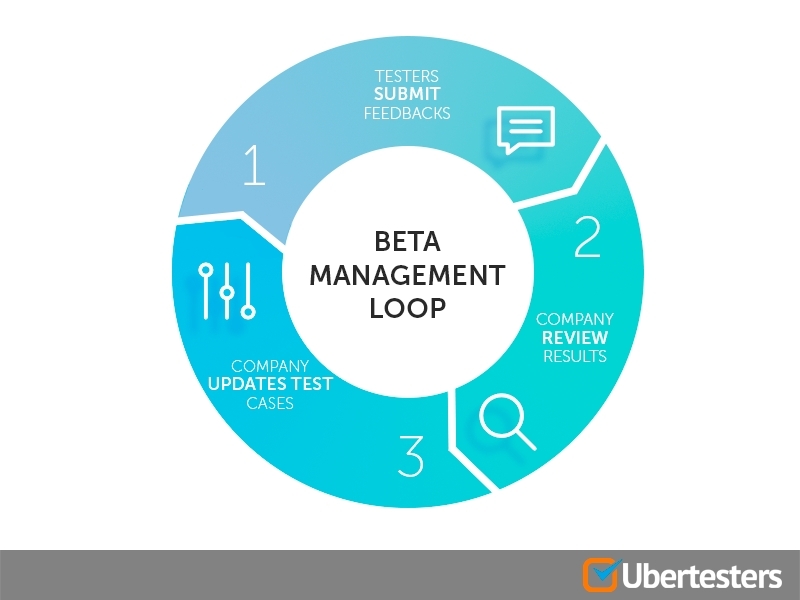 At Ubertesters, crowd testing services are available in addition to the most advanced beta management software tools. With the help from professionals, experienced project managers and community managers, your beta testing process will be on the right path and in the right hands.